By hungry runner on September 1st, 2011 . Filed under: Stationary . I really love sending mail! And even though I have a large collection of stationary I always find new cards and postcards that I want to purchase. I came across these Holly Webber postcards and am tempted to buy the cupcake ones. 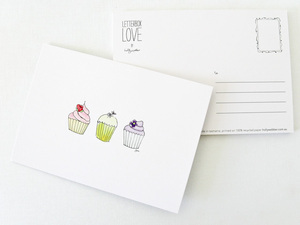 The postcards are $2.50 each and there are four different cupcake designs, all perfect for birthdays or everyday use!